Aerostella came across this scan from the November 1999 issue of Game Informer. In it, it previews EarthBound 64 but calls it EarthBound 3. Anyway, this is another interesting look back at the old days at least. 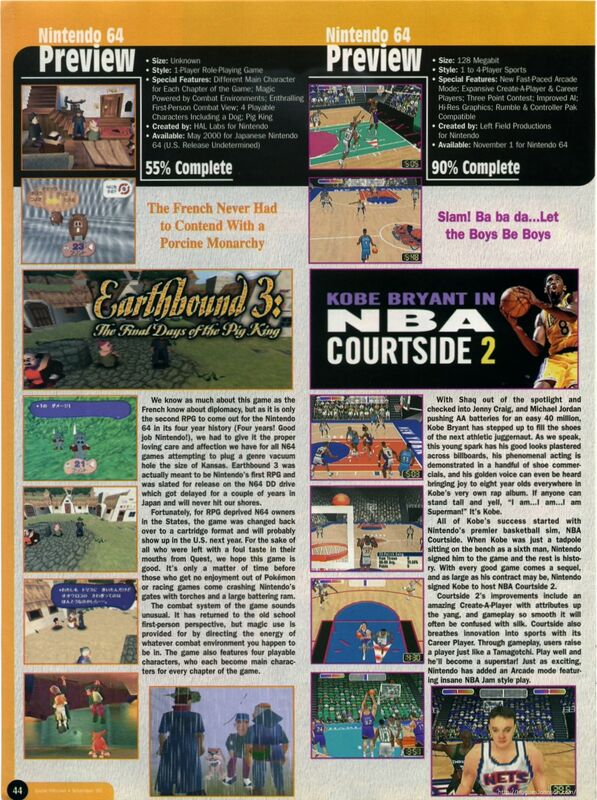 If anyone else comes across old magazine scans about any of the MOTHER/EarthBound series, please send ’em in! I’m actually interested in the fact that it mentions playable characters as a dog, and a pig king. Was He originally supposed to be playable? That would have led to a very exciting post-epilogue chapter, where he arrives to the islands. Or something. Yeah, I’m thinking they made that up too. In all the stuff I’ve ever read, that’s never come up until this, and this doesn’t strike me as a well-researched, hard-hitting report. I agree with PK Saturn here; I don’t think it’s saying that Pig King is a playable character. Though I do kind of like the surreality of listing “Pig King” as a “special feature” of the game, which: what? Hahaha I came here thinking you were talkng about a current issue. Perhaps ‘Pig King’ meant a chapter where you found out how Claus joined the Pigmask Army. After all, he is the second-most powerful member of the army. That makes since in facts thare are unuesd sprites of the Masked man walking. in mother 3 maybe you were to play as him. I’d like to think if Mother 1+2 and/or Mother 3 were released outside of Japan, Nintendo would have fixed the numbering, but that’s just a sad pipe dream. The artical is pretty interesting, though not very well done. Though I’m pretty sure there wasn’t a whole lot to talk about that hasn’t been said before. I remember back in the late 90’s I wrote an angry letter to Game Informer, accusing them of tricking naive parents (like my mom) into subscribing to their magazine, which I deemed more “biased” than IGN. Some editor wrote me back a fairly large email defending the publication and made me feel incredibly ashamed. But now, reading this, all of the reasons I wrote that bratty email come rushing back to me. Game Informer appeared to have an acidic disdain for Nintendo and the N64 particularly which bled into many of their articles. Earthbound 3 would be MOTHER 4. Which is being made, but they’re just calling it MOTHER 4. Also, that Magazine phailed.